Kayaks are fun. Even at the beginning of February when icicles obscure the face of our eastern Oregon basalt and snow covers the banks of the river. Granted, the one day Jeff and I had schedules that coincided for a day of river fun was the only day calling for rain/snow in the 10 day forecast. I am a firm believer that rain doesn’t bother you if you are already in or on the water, snow makes the trip more scenic, and driving sleet or hail simply builds character. 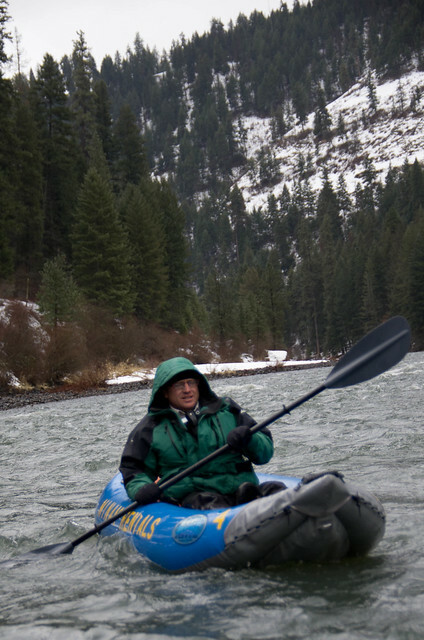 For those who are unfamiliar with the Grande Ronde and the Wallowa, most Grande Ronde trips start on the Wallowa River at Minam where there is enough flow throughout the year to float a raft. Decent floating flows can often be had from late October through end of July and even sometimes into the beginning of August. After floating on the Wallowa for ten miles the river joins the Grande Ronde. At some point there was a functioning bridge and people could drive to Rondowa. This is no longer the case and you must float (ten miles from Minam) or hike 3 ½ miles from the Palmer Junction access point. We decided we would both float the ten miles and then hike the 3 ½. When flows are high enough we will often do day trips from Minam to Powwatka bridge a distance of 39 miles, but it makes for a long day this time of year. I bought a kayak dolly last year that I used to transport two kayaks five miles in to Joseph Creek. Before we reached Joseph Creek the tires were pretty well destroyed. I had bought new solid rubber tires since then and even purchased a different kayak dolly that was supposed to be “heavy duty.” The new “heavy duty” dolly didn’t show up in time for me to take into the Wenaha so it has been sitting waiting for a test run. Jeff and I planned on taking fly rods to fish, but as the morning came and our quick getaway wasn’t so quick, it was noon before we were actually on the water and floating. 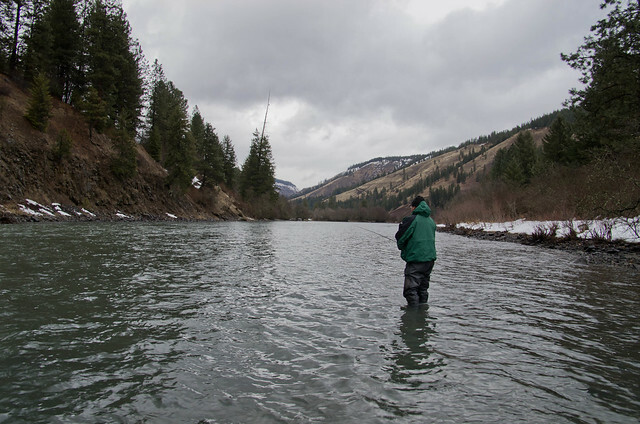 We passed several bank fisherman at the Minam State Park and a few further down and saw several with steelhead on the line or steelhead lying on the bank. I did catch a rare Wallowa River basketball floating just below the state park and Jeff and I tried to invent a new game that was a cross between lacrosse and kayaking. We soon decided it was not quite warm enough to be throwing a basketball on the end of the kayak paddle when ice cold water was also being delivered with the basketball. Abandoning our new game as quick as we started it, we didn’t stop to fish until we had covered 7 or 8 miles of our ten mile float. I have built a few new rods this winter including a few switch rods. Jeff had not had the chance to try one of them out yet and was trying to get the feel of casting two handed when I suggested he let me show him. As he let the rod tip down and walked towards me the end of his line went under and he had a fish on. I decided he was getting the hang of the switch rod since I merely had to suggest that I show him something for him to actually hook a fish and I waded back to the shore to grab my camera and play cameraman while he landed his fish. Unfortunately he didn’t get it landed. He hooked one more fish before we decided we had better keep moving down the river. Near the bottom of the run Jeff noticed a bald eagle sitting in the top of a run which is just barely visible in the picture below as a small bump near the top of the standing snag in the middle of the picture. I have become slightly obsessed with learning about photography over the last year hoping that I can begin to do a better job capturing the places I like to hike, float, and fish. As luck would have it my latest “investment” in photography was a 1.7x teleconverter. The teleconverter is a simple little device you attach between your lens and camera body. The teleconverter more or less magnifies the image coming through the lens. I have tried to take pictures of birds many times with little success in getting a presentable picture. The picture I took below is probably my best attempt at an eagle so far. Had I been on my game, a simple switch of my focus system would have tracked the bird with a focus point. Next time I will do better. Jeff and I made our way down to the Grande Ronde at Rondowa. Although the Wallowa had been very clear the Grande Ronde was coming down from a snow melt binge and running brown. 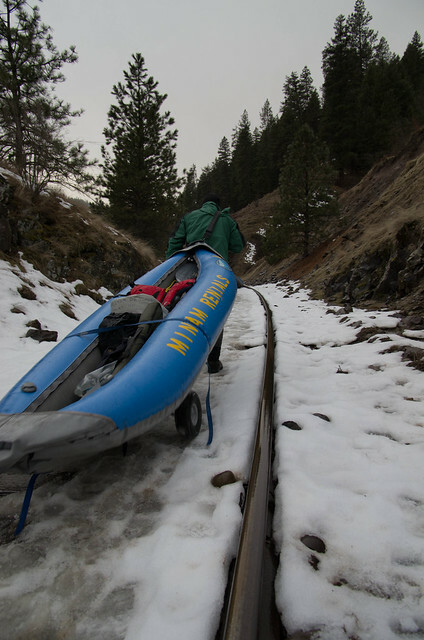 Jeff and I broke out the kayak dollies, strapped the inflatable kayaks down, and began pulling them up the railroad tracks to Palmer Junction. It worked OK. I won’t say it worked great, but it worked. The first small section of tracks had no snow and the wheels would go down between the ties and catch requiring a good pull to get them up and over. I began hoping that there would be more snow to fill the hole in between the railroad ties. I quickly got what I asked for and decided I did not like the snow any better. 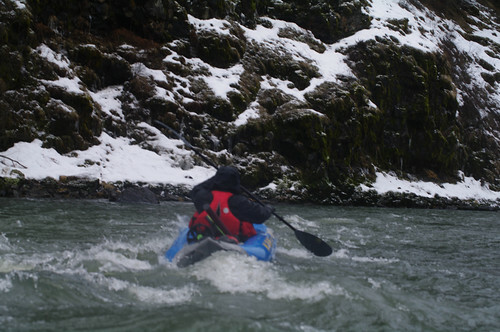 The snow was simply more work to pull through and the wheels on my new kayak dolly are solid plastic which often tended to skid through the snow more than roll. Next trip I think it is time to break out the pack rafts and see how easy they are to pack out. As always, you can see more pictures on my flickr page here. You can also look at pictures of all the trips I have done over the last five months that I have been too lazy to write about . . . or I mean too busy learning about photography to take time to write. Perhaps I will have to begin simply putting up a few pictures when I don’t have enough time to do an actual write up. I was wonderin just the other day when the next report would be coming out. Good stuff as always. Switch rods huh? How is the weather in Boise? I have a few different models of switch rods now if you want to try one out to consider for our trade. Just shoot me an email. Hey Grant, It looks like you guys had a good time. I might try it out with it’s a bit warmer. Maybe then the basketball game would be fun to try. Your eagle picture is great. Warmer weather is always nice, but the basketball was a rare find. You don’t find too many of those floating down the river. I actually think the basketball was someone’s bobber. Some of the fisherman throw huge old bobbers out on the water.